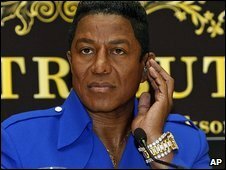 Jackson said his brother's moves "inspired people across the world"
Jermaine Jackson will be one of the judges on a new six-part BBC Three talent show to find performers who can dance like his late brother Michael. Producers of the Move Like Michael Jackson series will search the UK to find dancers "with the showmanship and technical ability of the great man". Jackson said Michael "inspired people across the world to master his moves and create their own unique routines". Auditions will be held in October and the show will be aired later this year. "I'm really excited and delighted to be part of this show and look forward to finding the UK's most talented and inspiring dancers," Jackson added. Commissioning executive editor Karl Warner said the show - which will be shown over the course of a week - was "a brilliant way to honour him". "We want to hear from anyone who's ever been inspired by the Moonwalk, the Smooth Criminal lean or the crotch grab and find out if they can move like Michael Jackson." Auditions will be open to anyone aged 16 and over.